If you are looking for somewhere quiet and laid back with stunning scenery and beautiful valleys, you will be hard pushed to beat the Axarquia in southern Spain. Situated just east of the city of Malaga, the Axarquia is made up of white, inland villages, open countryside and coastal villages. Many of the ancient Axarquia villages date back many centuries and mostly originated from the time of the Moors who arrived from North Africa, forming the Moorish Kingdom of Al-Andalus. The villages are almost all built on steep land with side passages, cobbled streets and picturesque old squares dotted around. Many houses are accessed via steep steps and the Church is the focal point of the villages. Even though the villages may vary from place to place, most offer shops, bars, cafes, restaurants and a weekly market. Some of the main villages in the Axarquia to visit include: Periana, Benamargosa, Colmenar, Frigiliana, Iznate, La Vinuela and Trapiche. Velez-Malaga is the capital of the Axarquia and is situated between the mountains and the sea. This typical Andalucian town offers a wealth of historical and cultural attractions without being crowded with tourists. During the past 20 years, ex-pats from all over Europe have made the Axarquia their home, resulting in a Cosmopolitan feel to this ‘authentic’ part of Spain. Also, English is not spoken half as widely as it is on the coast, so this will help any ex-pats who want to learn the lingo. Local children are brought up to observe and join in local traditions, fiestas and festivals, which is a part of their daily lives and strong family ties mean that misbehaviour is very much frowned upon. Family bonding here is very much like stepping back in time to a simpler way of life. 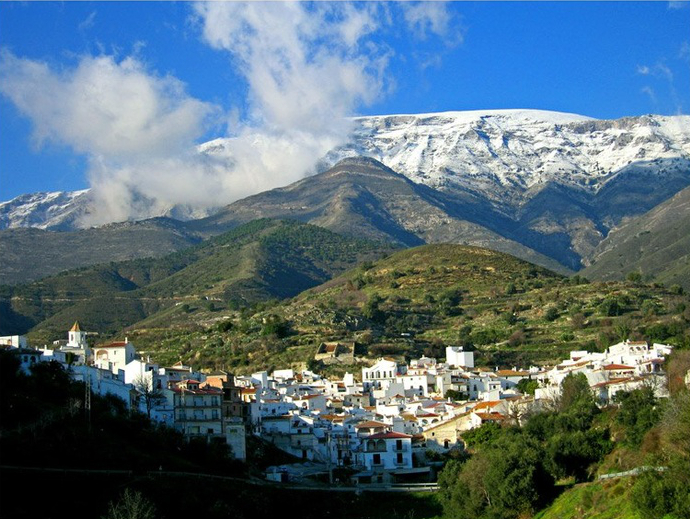 The higher up you go in the hills of the Axarquia, the colder it will be during the winter months. On the plus side, the air will be fresher on summer mornings. The villages were largely inaccessible until relatively recently but good road access has now improved transport links between the villages. Money also tends to go further inland than it would on the coast if you are looking for properties for sale in the Axarquia. Pretty much anywhere in the Axarquía is less than one hour to Malaga Airport, and half an hour at most from the beach. Good roads mean that within a couple of hours you can be in Granada, Ronda or Cordoba and there is a constantly developing range of rural activities being offered to visitors, including horse riding, cross country rides on motorbikes and bicycles, hiking and much more. Properties for sale and rent in the Axarquia include village houses, townhouses, apartments, fincas and villas both inland and closer to the coast.